This means lower hotel rates and great restaurant deals are in effect, so it’s the perfect time to explore Palm Springs without the huge crowds and high costs. It’s also a great time to submerge in the Modernism experience by staying at one of the Mid-Century Modern boutique hotels, taking a city tour of the many Desert Modern public buildings and neighborhoods, exploring on foot the treasures of the Uptown Design District, and dining in hip retro restaurants with an ultra-modern vibe. This year’s ShortFest roster of 323 films screens at the Camelot Theatres in Palm Springs. Films were selected from more than 3,000 entries worldwide and represent 53 countries. It’s global reach “once again… has exceeded our expectation,” said Kathleen McInnis, ShortFest Film curator/director of industry programming. This year’s star-studded shorts feature Academy Award winners and nominees as well as film and television stars. Christopher Lloyd and Kathy Bates in Cadaver (USA); Adam Brody in Double or Nothing (USA); Judi Dench and Tom Hiddleston in Friend Request Pending (UK); Stellan Skarsgard in Our Need for Consolation (Sweden); and Julie Louis-Dreyfus and Rachael Harris in Picture Paris (USA) are only a few of the films and stars expected at the festival. 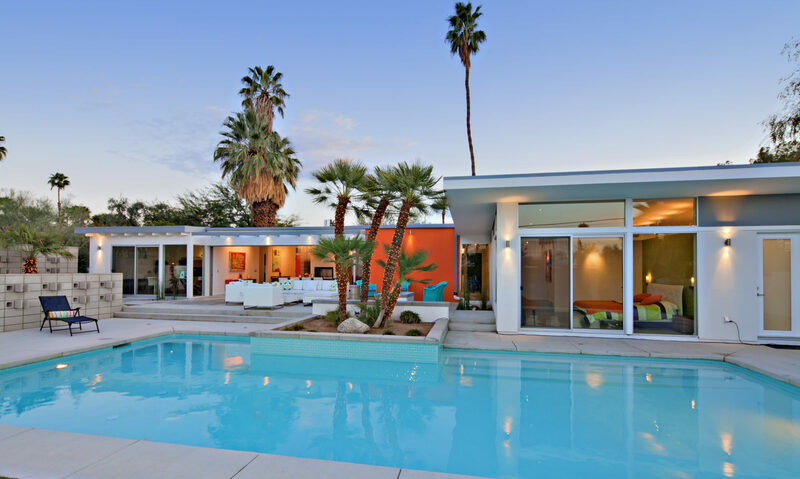 Just as the world’s film industry has “rediscovered” Palm Springs, appreciation for its Modernist architecture has resurged, attracting serious attention from up-and-coming architects and savvy homebuyers. The Orbit In Hotel, nestled between the mountains and Palm Canyon Drive, offers a Mid-Century Modern realm complete with vintage tunes, poolside lounging, cruiser bikes, and “Orbitinis” served at the Boomerang Bar. A Place in the Sun Garden Hotel was built in 1951 as a retreat for the production crew of the film classic that starred Elizabeth Taylor, Montgomery Cliff, Shelly Winters. This historic Mid-Century desert oasis captures the essence of old Palm Springs with 16 renovated bungalows all with private walled patios. Twin Palms Resort is an authentic architectural gem from the 1950s, fashioned from the glory days of Sinatra and Crosby. Casually stylish in south Palm Springs, close to the Indian Canyons and the swank, retro Twin Palms neighborhood homes and estates. Desert Hills, snuggled up to the rugged San Jacinto Mountain, is one of Palm Springs oldest luxury boutique hotels, built in 1956. Situated in the famous Tennis Club district where architects such as E. Stewart Williams, Don Wexler, and William Cody designed homes for movie moguls and industry leaders. The hotel retains its Mid-Century aura with rooms and suites reminiscent of the 1950s and 60s. Fourteen studio and bedrooms suites open to private patios overlooking a flower-filled courtyard. Built in 1952, the Horizon Hotel is a beautifully renovated, 22-room, Mid-Century property minutes from downtown Palm Springs, and one of the few architecturally intact hotels. Unobstructed views of Mt. San Jacinto, lush gardens, chemical-free pools and continental breakfast delivered to your patio or poolside are a few of its amenities. Located in the Movie Colony neighborhood, famous for the movies stars who had homes here between the 1930s and 1960s, the Movie Colony Hotel was originally designed by Albert Frey in 1935, one of the first of his works in the desert. After recent extensive renovation, this hotel has won two national architectural awards for design excellence.